When you decide to have a swimming pool at home, there are extra features you must consider. Pool lights are rising trends among pool owners because they offer functional and aesthetic benefits. These lights illuminate the pool at night and assure swimmers, but there are other benefits from installing it. A properly-installed pool light provides a resort-like vibe in a private pool. Ideally, the lamps must illuminate all parts of the pool equally. The light must have good diffusion level to illuminate the entire pool. However, it must also have low electricity consumption, since the outdoor pool means additional spending in utility. Recently-produced lights have new features that improve the old versions. Some have diverse color spectrums, perfect for creating a unique atmosphere. Others have a remote-control system, magnetic panels, and the ability to float when separated from power supplies. Choose the features that you need the most based on your pool needs. Here are 10 best pool lights you should consider if you think about embellishing a pool. Looking for a standard pool light? Pentair 78456100 Amerlite gives you the best specs from a common product. 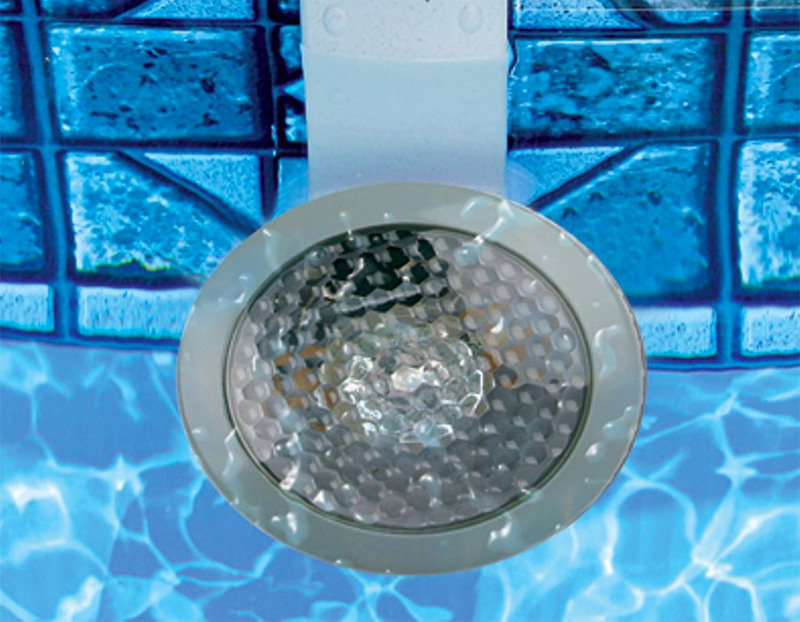 This 500-watt, the 120-volt incandescent bulb is surrounded by a stainless ring for sleeker pool look. The lamp has strong, tempered glass as a prismatic lens, diffusing the light evenly in the pool area. The uni-tension clamp keeps the parts held together, even after years of using. This lamp produces a beautiful white light that gives the resort vibe. However, the product also comes with medium blue lenses. It also comes with 50-feet cord. Recommended bulbs are fluorescent or LED. However, if you want to have a dimming option, make sure to install filament bulbs. This lamp is great for a “traditional” pool lighting. Pentair 78448100 Amerlite offers reliable, practical pool light from sturdy materials. The tempered glass lens is surrounded by a stainless-steel ring, protecting it from rust and corrosion. The sleek ring has subtle engravings that add an elegant touch in the pool. The ring and lens are joined by Uni-Tension clamp, creating a sturdy design that is also easy to assemble. One notable feature of this light is low water protection. The lamp keeps its temperature at a safe level even when the water is low. You also don’t need to lower the pool water level when replacing the lens. The overall structure consists of simple assembly, and you can install the lamp without using complicated methods. Want to create a different mood? Purchase colored lens covers that have red, green, and blue shades (sold separately). The lens covers have snap on feature, making them easy to attach and release. Intex LED is a perfect light for an above-the-ground pool with soft surface. The lamp has a magnetic panel that helps it stick to the pool interior. You only need to stick the two elements together like a clamp, and your pool will immediately get bright light. The LED bulb provides better lighting intensity than traditional bulbs. Intex LED is also a great option to hold a pool party. You can install and release the lamp easily. The 23-feet exterior cord provides energy without additional batteries. When the power source is dislodged, the lamp will float in the water. This is also a good option if you want pool light with low electricity consumption. 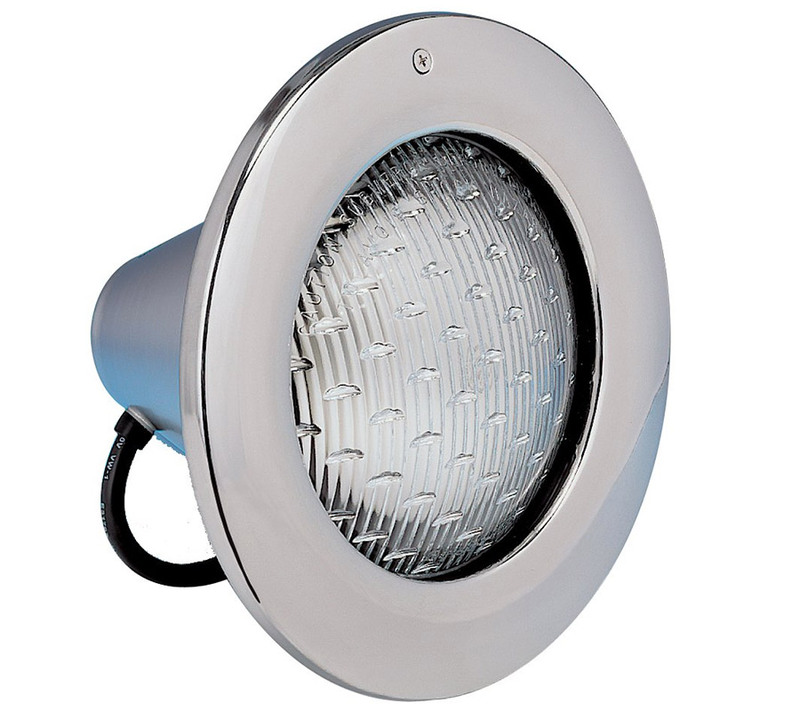 Another great traditional pool light, Hayward AstroLite provides a sleek look with a stainless-steel ring. The design uses a lock clamp system for easier assembly. The smooth, sleek rings are corrosion-free and rustproof. There are options for 100, 300, 400, and 500-watt light. The material is perfect for any standard hard-sided swimming pool. This light is perfect for changing the mood in the pool. You can easily change the standard lens for colored ones. There are options for red, yellow, light blue, and dark blue lamps. Depending on the product version, you can choose a light with specific cord lengths, such as 15, 30, 50, 75, and 100 feet. Need something to illuminate a nighttime pool party? Smartpool NL35 is an easy option. 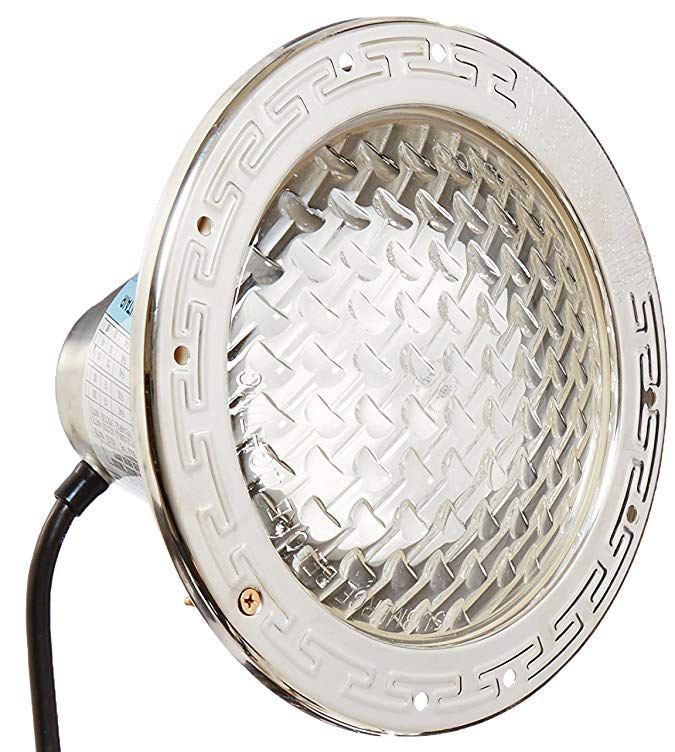 The halogen lamp creates bright but evenly diffused light. You will get soft, even light distribution that creates a resort-like atmosphere. The material is corrosive-free and rustproof, able to handle water return process or pool chemicals. The textured, tempered glass creates a nice lighting effect when submerged. Smartpool Nl35 has easy installation method. You don’t need to drill the pool wall, making it perfect as a lighting source for a pool party. A single lamp is enough to illuminate a small to the medium-sized pool. You can also buy it in the package to get more light distribution for a larger pool. This lamp also has an energy-efficient mode, reducing utility bill. 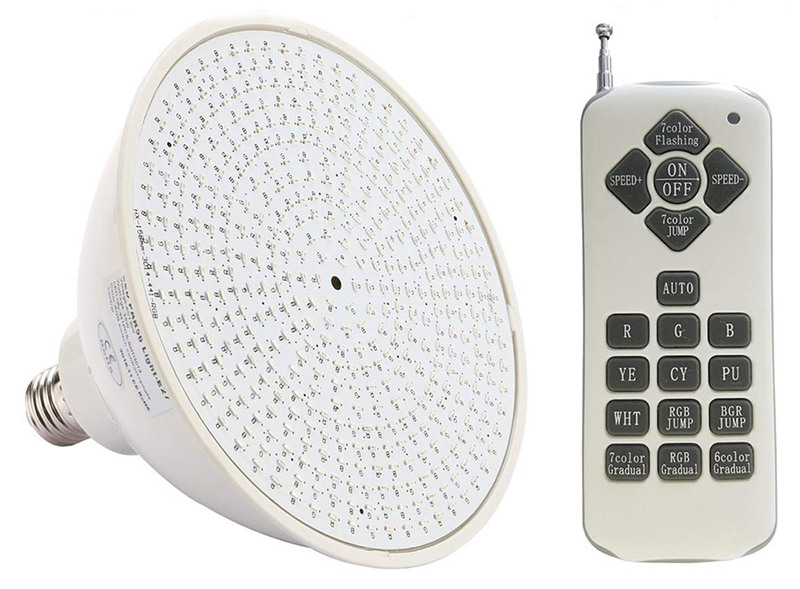 If you have Pentair Hayward Light, you get more options to create a unique ambience in the swimming pool. The P&LED Color Changing Bulbs are a set of replacement bulbs with different colors. One set of these bulbs give you unique colors, such as red, blue, purple, green, and dark blue. They fit with most Pentair Hayward lamps, so it is easier for you to find fitting colored bulbs. The best thing about these bulbs is their smart ability. They come with remote control function to switch between colors and light intensity. One set of these bulbs is ideal for illuminating a 25,000-gallon of the swimming pool. The red bulb is the weakest between the colors; it only emits 13-watt light intensity. Another great feature is the memory function. These bulbs are among the first brands that can be turned on with the latest setting you use. If you set up a specific lighting mode for more than 30 seconds, the bulbs will display that exact mode when you turn them on again. If regular pool lamp is too basic for you, why not trying SUNWIND? This underwater solar light looks like a glowing jellyfish, giving you amazing light performance underwater. It has rotating strobe lights that can go on for eight hours after fully charged. 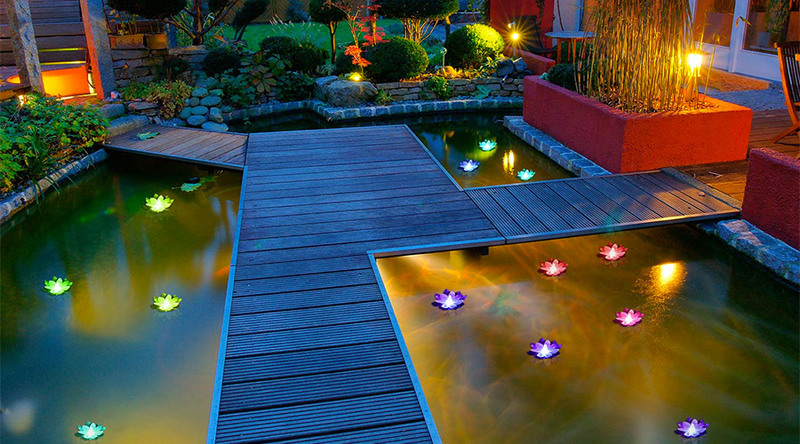 The glowing green lights also add a magic vibe to your pool or pond. A set of this lamp can make your outdoor wedding or party more interesting. Each SUNWIND lamp has an invisible solar panel that absorbs energy during the day. Ideally, the solar panel must get eight to 10 hours of continuous light to perform in full capacity. Aside from the strobe light (which you can turn on and off anytime), the lamp has LED light that looks visible under the surface. The material is PE plastic, making each lamp lightweight and easy to float. SUNWIND also has an IP67 water resistance level, making it work properly even after hours and days of being submerged. Another beautiful option for decorative light, LOGUIDE Flower Light has lotus shape and bright color options. This beautiful lamp will create a pretty, almost magical sight when you float it on the pool. Floating a bunch of these lamps will create an amazing decoration for an outdoor party, wedding, birthday, or holiday celebration. The lamps come in a soft glow that does not hurt the eyes. Multiple color options such as red, pink, blue, green, and cyan make your pool more interesting. Each lamp is powered by two CR batteries, which provide 100 hours of continuous lighting. The bottom part is waterproof and floating easily, making the lamps stay on the water even when the surface is slightly disturbed. The newer version of this lamp has a waterproof bottom for the battery box. It protects the batteries and keeps the lamps working for as long as you need. The combination of plastic and foam materials makes these lamps lightweight and easy to transport in bulk. Need waterproof light that can work in wet and dry environments? 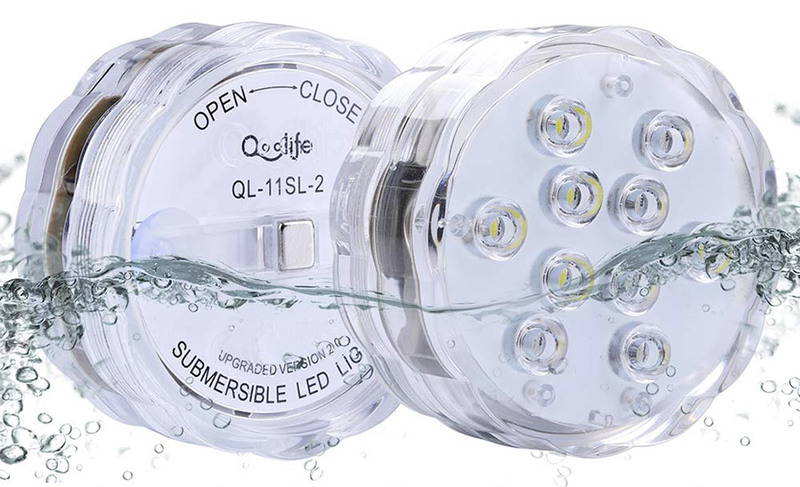 Qoolife magnetic waterproof light is your choice. This set of lamps provides seven color options such as white, blue, red, green, and yellow. They look great when installed in the garage, pool, bathroom, patio, terrace, and wherever you need decorative lights that can handle natural elements. Each lamp is equipped with a sealing ring, which stops water from seeping into the component. You need to make sure that the seal is intact before submerging the lamp, but once put in place, the seal works wonder. The lamp set also has a remote control that allows you to change light colors. There is also flash mode that you can turn on or off remotely. Qoolife is powered by two AA batteries, but you need to take them out when not using the lamp to avoid standby power consumption. While Qoolife has default magnetic panel, it does not work too well on the smooth surface. You need extra suction cups before attaching the lamp to the smooth surface. Forget traditional lamps to illuminate indoor and outdoor spaces. 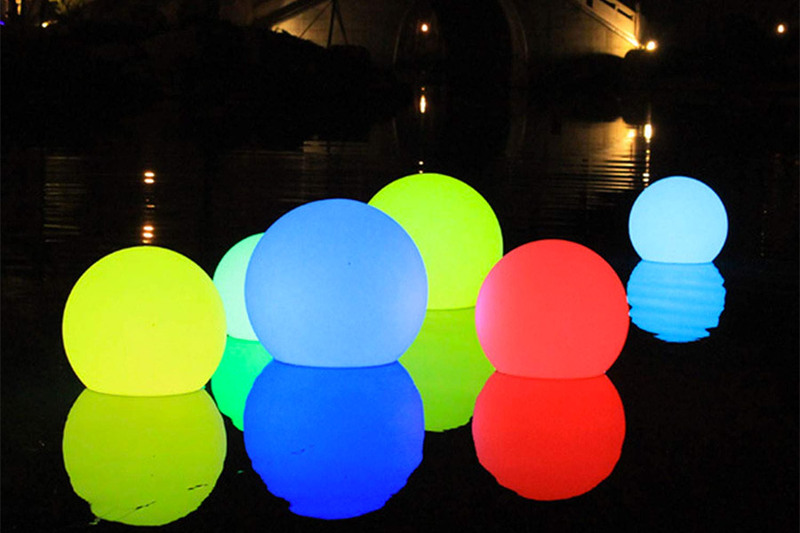 LOFTEK LED light ball adds a contemporary touch in the shape of colorful, glowing balls. The soft light illuminates the small area without blinding your eyes. It comes in various sizes to match your lighting need. The colors include red, blue, white, and yellow. 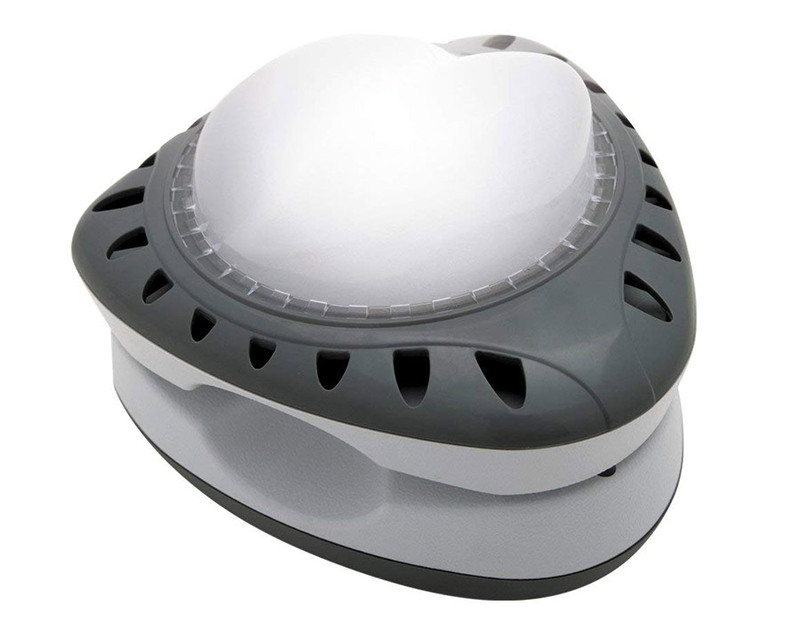 The LED light ball is perfect for creating ambience in the restaurant, patio, or bedroom. It can also illuminate a kid’s bedroom. LED light ball is also a great sensory toy to stimulate children. The acrylic material is waterproof and buoyant, making it perfect as a unique swimming pool decoration. The light is safe for skin and does not emit UV or toxic elements. Pool lights now come with various shapes and features. They provide more flexible options from energy consumption, color, design, shape, and illumination style. Make sure you consider each option before choosing the right lamp that suits your needs.